A high-end production suite with everything you need to record, mix and master, DP8 is a serious contender. A Windows version at long last! 64-bit support. Beautiful customisable interface. New plugins - especially for guitarists. Even better video support than v7. Lacks a decent soundbank. Instruments need MIDI and audio tracks. It's finally happened. Longtime Mac stalwarts MOTU have at last released a PC version of their high-end DAW, and we're happy to report to all you Windows users that the wait has been well worth it. Trailing some six months behind the Mac version, Digital Performer 8 also sports 64-bit and, as you'd hope, VST plugin compatibility. Yet there's more to v8 than just cross-platform cooperation. Long-time Digital Performer users will find improvements galore, from minor changes such as the fully dockable Control Panel to the entirely new video playback engine, which enables full-screen viewing of 720p or 1080p video on either your primary or secondary monitor - sure to receive rapturous applause from Digital Performer's many users in the film industry. We installed DP8 on a Windows laptop in both 32- and 64-bit modes. Installation and authorisation are painless - you can authorise on two machines using the provided keycode. Mac users will be prompted to select their preferred primary plugin format: AU or VST. Choosing one doesn't preclude use of the other - it simply becomes the option presented in menus by default. MOTU's MAS format plugins are still included and supported. "There's flexibility throughout the application, from the plugin management tools to the customisable consolidated view"
Don't be put off by DP's default plain appearance; there are other themes to choose from (15 new ones), affecting both the colours and the design of the knobs, faders, meters and more. There's similar flexibility throughout the application, from the plugin management tools to the customisable consolidated view. If you don't like the way DP looks, it won't be because you're left wanting in terms of options. If you've used previous versions of Digital Performer, DP8's interface will hold few surprises. However, those moving over from the competition might well be in for a bit of head scratching. DP unashamedly goes its own way, and some of MOTU's nomenclature can be baffling at first. In many areas, though, it follows the standards adhered to by most other DAWs, sporting multiple simultaneous and customisable views that can be floated or used in a consolidated window. We prefer the latter approach - DP8's consolidated window is surprisingly uncluttered, even with eight panes active on a laptop screen. That's a clear indication of the diligence and UI design craft employed by the developers. 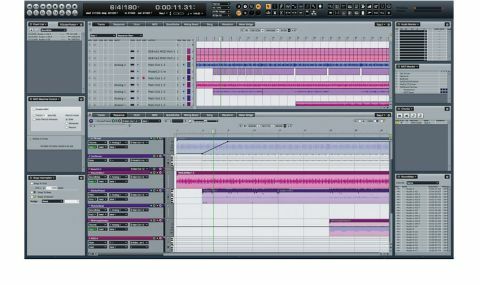 At its simplest, Digital Performer can be configured to resemble the likes of Cubase or Logic, with most audio, recording, automation and macro editing taking place in a single view called Sequence. However, much of this can also be handled in the less cluttered Tracks view, which you can have open at the same time. The Tracks view is akin to the project overview that sits above the arrangement view in some other DAWs - except that, in this case, you can copy, paste and move things around directly within it. Additional views include Waveform, the superb Mixing Board, MIDI, Score and Meter Bridge to name but a few. You can access timestretching, beat-matching and an excellent in-line Melodyne-style pitch correction "layer". "Newcomers will be shocked by just how different DP8 can be to the competition"
Then there's the Song view. Digital Performer allows you to use multiple Sequences in the same project, and any number of Sequences and Songs (called Chunks in this context) can be arranged in the Song window. Thus, you can work on different versions of the same project at the same time, swapping, reordering and rearranging them, or arrange songs into an album. You can also use V-Racks (which are also considered to be Chunks) to create a central set of instruments and effects plugins (a mastering suite, for example) to be tapped by the various other Chunks in play. This is all primarily aimed at film and game composers, it should be said, and the average musician may never actually come into contact with any of it. It's a very flexible system, but one that can be daunting to the uninitiated. However, it would be a mistake to overlook its potential as an album mastering tool. Chunks, Songs and Sequences aren't new to DP, but newcomers will be shocked by just how different DP8 can be to the competition. Upgraders, meanwhile, will surely dig Punch Guard, a sort of "look ahead" tool for recording that ensures that anything played before or after a punch-in/out will be captured as well, just in case. Nice. And of note for Mac users is the fact that DP's GUI is now built 100% on Cocoa. We're impressed with Digital Performer 8. It's a mature, well-defined DAW that is on an equal footing with any of its competitors. It is different, certainly, and it takes some getting used to, especially if you've spent a lot of time with the likes of Reaper or Sonar. If it comes up short anywhere, it's in the bundled instruments. Some are excellent and unusual, but a decent ROMpler is notable by its absence. Also, it lacks a combined Instrument track - virtual instruments require both an audio and a MIDI track to work. Those complaints aside, there's a massive amount of power and flexibility here. Working with Digital Performer is one of the most satisfying experiences we've ever had with a DAW, and we can totally understand why anyone might want to jump ship to it from another one. It's an excellent package and well worth the asking price.